Inquiry 2018: End of Year DMiC Reflection. We were told at the beginning of our DMiC journey that we would need to be patient to see the results of introducing a new type of collaborative problem solving based maths programme. As teachers we often want to "fix" a problem immediately. We teach and then assess and expect what we have taught to have been absorbed and the problem is now "fixed". Our mentors were so right to tell us not to expect results immediately. Not only were the children learning a whole new way of participating in a maths lesson but so were we as teachers learning new "talk moves", how to write engaging questions, how to scaffold but not lead discussions, teach the norms and know how to ask open ended questions and to try and engage all learners when some did not wish to be engaged or did not have the necessary maths knowledge to help their group even with simple counting on materials. 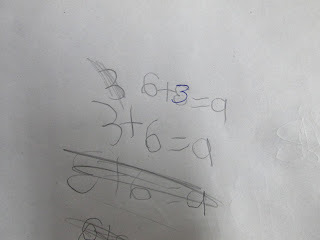 By the end of Term 2, I was already seeing a change in the maths thinking of some children. They were beginning to ask "rote" questions and they were prepared to be patient and work with a small group, following group norms and having some good discussions. Not every maths lesson was successful but I could see that there were more successful lessons than unsuccessful. Some children were able to give an answer to a problem but they found it hard to make their reasoning "visible" to others. Explanations were often a simple "because..." with no real logical answer. A sort of "I know so why don't you not know as well." Terms 3 and 4 still left me trying to engage my reluctant learners and worrying how these children would gain number knowledge. The mentors said that children would gradually become more engaged and that they would "learn on the job" and this is exactly what did happen. When I used the JAM test at the end of term 4 I was pleasantly surprised to formally assess their knowledge. I had seen children extend their number knowledge, quickly count in 2s and 5s and share things equally when solving problems but to be able to look back at previous results and see just how much progress was made was satisfying. A snap shot of priority learners to show their increase in Add/sub and number Id. The participation of children in the discussions showed a marked improvement through out the year with some children becoming very proficient at explaining their ideas in a clear and logical way and needing just a small amount of support to do so after all they too have been learning how to use language to hold a mathematical discussion. 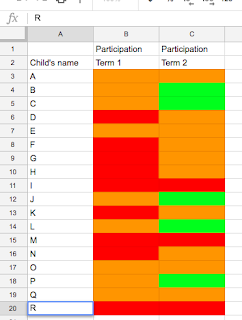 There was far more "green" on the Term 4 data as well as some "grey" whereas there was far more "red" with a small splattering of "brown" in term 1. For those children who can use the norms and listen to other children's reasoning (not arguments) then persuade others that there might be another way of looking at the problem it is great to see the progress they have made. In a recent problem I had a picture of a pattern built using Duplo blocks. The challenge was to guess how many blocks were used without counting the blocks one by one. I thought they might be able to find two solutions but they surprised in finding seven solutions before we ran out of time. These included being able to see that some of the solutions were repeated addition, groups of 10, symmetry of groups, multiplication (groups of) and the commutative law. Given time to work collaboratively through this problem they were able to see different possibilities and share their thinking to help others see another possibility. The debriefing at the end also helped others see the possibilities. All this also shows the development of the children's language. They try to give logical explanations and use mathematical terminology to be more precise in their descriptions of what they have found not just give a vague wave of the hand over a drawing. They are encourage to ask questions (although many are still what I call "rote" questions because they find difficulty in framing a question and building their reasoning skills). 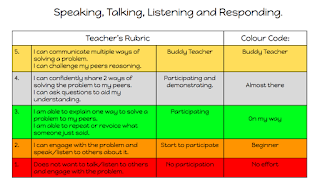 The norms of having a discussion with one person talking and the other group members listening and giving others time to think, has flowed through to other areas of classroom discussions. I will certainly be introducing the norms early on in maths next year to get DMiC maths off to a flying start as well as using it in class discussions in other areas to show that this is the way we have a discussion. Using the maths wall as a warm up each day has helped children learn shapes and to think about why I have grouped certain shapes together. It is no longer enough to say a vague "because..." but they are trying to explain their thinking using every day language such as "four corners" or "one long side". Fractions, before and after, subitizing of numbers, tens and ones, counting in 2s, 5s and tens all help show maths and the language it uses is all part of our life and is not something too difficult and to be avoided at all costs. It is exciting to come to the end of the first year and to realise how the expectation that everyone contributes and encourages others in DMiC maths has helped in the acquisition of language. 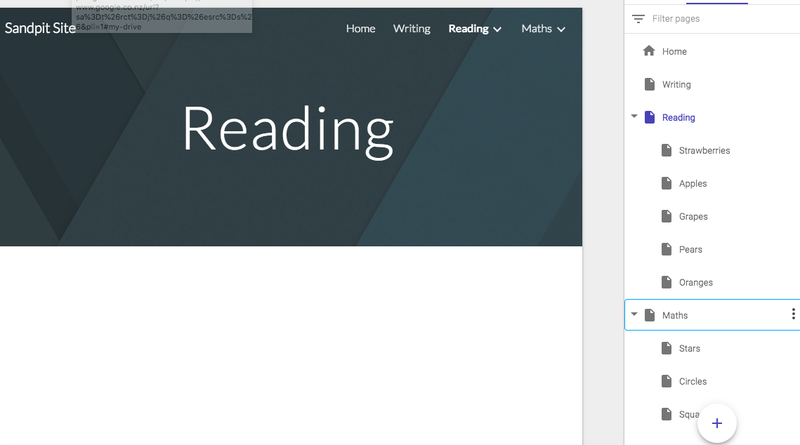 Inquiry End of Term 4: Getting around a Writing Road Block Successfully? This Term I have been trying to help some of my writers who struggle to write a complete sentence. They are able to generate their ideas into a sentence orally but fail to write all the words into their sentence. They are reading at a level whereby the sentences are varied and not just simple sentences so they see and read examples of sentences each day. 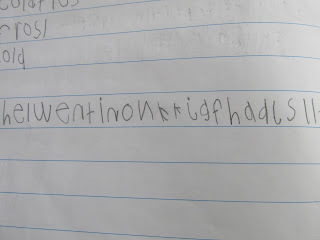 An example of the "missing words" writing. To help these children I have observed them writing and wondered if it was "the remembering what they have said" in the process of writing that is the problem. I have been working with a small group getting them to generate an oral sentence, say it to the group, check with the group that it makes sense and has the correct grammar, then record it on their iPad. Already I am finding that the group listen carefully to each other's sentences and will say, "That doesn't sound right. We say it like this...", or "You need to say 'the shop' not just 'shop'." This is helping them to remember to think carefully how they say things. When they think it is correct they push the record button and then the recording is played right through to see if it sounds right. The writing phase can then begin in their writing books. At first it was just a single word that was remembered and even then it was often checked and rechecked before progressing to the next word.The sentences are mainly simple sentences with the high frequency words from the "Butterfly" spelling resources but as the aim of the process is to get the children to write a complete sentence "that makes sense" and not just a list of random words we have had great success from the first day. The process is now taking them less time, they are remembering more words to transfer and there is fewer corrections from their peers. How does one measure the success of using digital technology to get around this "writing road block"? Unfortunately, on our formal assessment of writing (easTTle) there was no change. But informally when we use group discussion and the iPads there has been a measure of success. 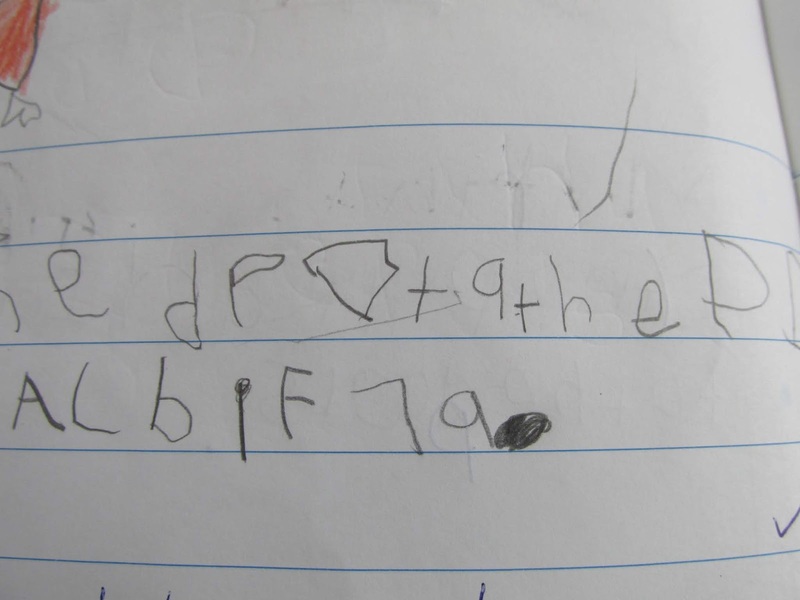 They are small steps in relation to what a similar aged child might be able to do but it is huge when measuring the confidence in writing for the two children who have had a measure of success with it. One child is now writing simple sentences independently "with some teacher encouragement" to complete the job. Not only is she able to put her ideas into a sentence "that makes sense" she now has the confidence to write without having to record and check her story and for her this has been a huge step forward and a boost to her confidence. 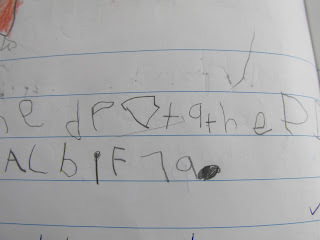 Another still checks with me, but he is beginning to have more confidence and gets on with his writing without recording his sentences. Two other children find that they still need the recorded story to help get a simple sentence written. The time factor of constructing their stories orally, recording it, listening to the recording then writing it out has not made these two despondent about writing which is a positive thing in itself. 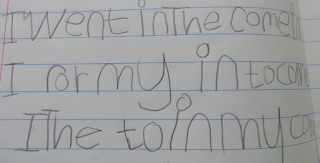 I would certainly introduce this method earlier next year to help children gain confidence in their ability to form their ideas into a sentence and write it down using class spelling resources. It might not be helpful to all children but if it can be a confidence boost for some of those who struggle with writing, it is worth trying to make writing a more positive experience each day. Labels: Getting around a Writing Road Block. For my Term 4 Inquiry topic I am taking a slight deviation, but still related to, the acquisition of language. 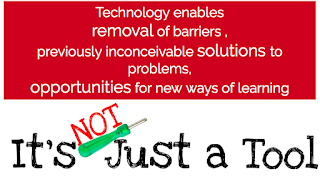 I want to identify and address the "road blocks to writing" that some of my students are experiencing and to try to help them overcome their difficulties, using technology. I have several students who have had more than a year at school, have reading skill levels ranging from Level 5 to Level 11 and yet they still struggle to write a basic sentence independently. 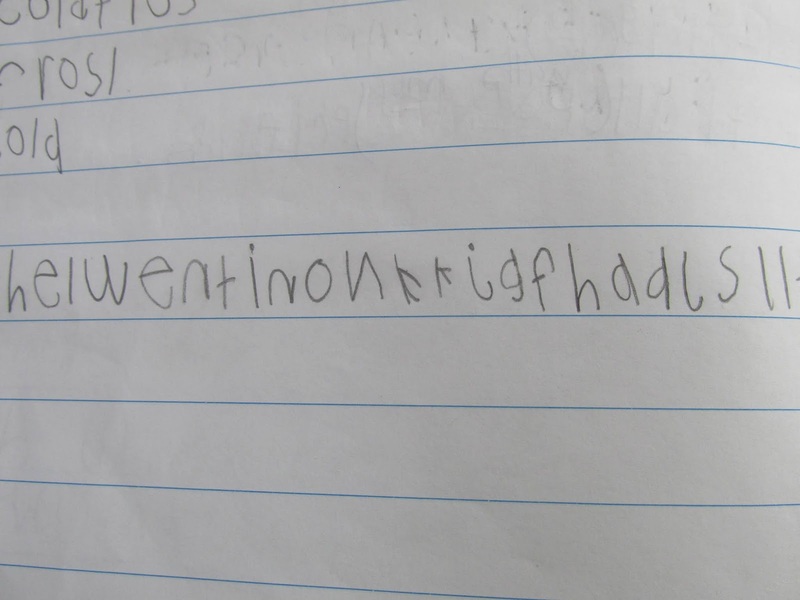 They write a list of random words during independent writing time. It is a simple "retrieve and write process" whereby they are not thinking about the topic, the organisation or planning of the text or the audience but only to fill a page with words that will look good and when asked to read it to me, they can tell an elaborate story that has no relation to any of the words or to the topic or they fall silent. 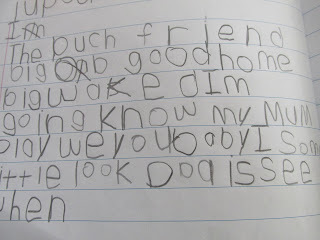 During supported writing, it is a huge effort to write a basic sentence. They can draw a picture depicting what would happen in the story and with a great deal of support they can tell you an idea, usually a single word, but it is the putting of this one idea into a sentence when things seem to come unstuck. Little attention is given to the fact that it might or might not be relevant to the topic and they don't understand that one word does not make a sentence. When a child is having to pay close attention to remembering what they want to say it seems to interfere with the what they want to communicate in their writing. Even though their reading books do not consist of one word sentences they are unable to model a simple basic sentence or see the importance of planning in writing. When helped to generate a simple sentence they have often forgotten what their sentence was by the time they have written the first word down. Perhaps using technology will help to overcome this road block. Modelling and planning a sentence orally places less demands on a child. A sentence can be spoken and remodelled with a minimum of effort compared to attempting to write it down so after modelling and planning a sentence orally, I will get these children to record their story on their iPad. This will then be abled to be listened to as many times as is needed as a temporary aid to help them write when they are unable to do so without such support. Even if the writing is not completed in one session, it will enable the student to complete the task successfully at a future time. Perhaps by taking off this pressure by being able to listen again to what they planned to write, this may encourage a more positive "I can" attitude towards their writing. Language acquisition and practising language skills still continues to be a focus this term. Participation in formal class discussions remains at a similar level as at the beginning of the term with some more confident children able to participate fully offering ideas, using a range of language from gifted words to informal language and using conventions of turn taking, looking at the speaker and asking questions. But it is the few children who continue to find it difficult to participate in formal class discussions choosing to opt out and remain silent during discussions that are a concern. Most of this group of children, mainly girls, talk readily in a more informal setting. They are able to chat with their friends offering support and ideas but are still find sharing with a larger group over whelming. I have been observing who they work best with, what they offer in a group situation and putting a more confident child to report back to the class in their group so that their ideas are at least heard and shared. We have just begun our assessment task for Move Ya Body. It includes being able to work in a small group to share ideas, to decide how to present information to the class by way of a series of pictures, a play or a movie, and to preform or present this information to the class. The children were enthusiastic about having a choice of how and what they can share. It will be interesting to see the choices they make. I have been thinking about how I motivate my students to write and felt it was time to try something new. 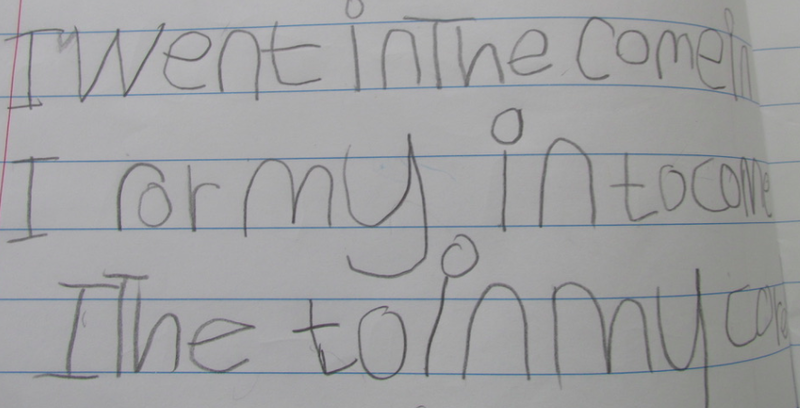 The children practise writing stories most days with a variety of motivation but I felt there needed to be more noticing of things like language used, attempted spelling using alphabet sound knowledge and even using punctuation and gaps between words. To begin, I let the children choose what they would like to take a photo of. This meant that they had to remember how to take a photo by going into a blank page in EE and using the camera to take a photo, crop it and then lock it up the top of the page. The next step was to think of two sentences to write about their chosen picture. They were able to factually record something or use their imagination and predict what might be going to happen in the picture. 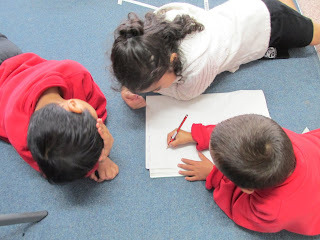 The children were very engaged on the task, so much so that chatter all but ceased as they worked away to think of a sentence and write it down. They wanted to get that part of the task over so that they could begin to type and see what their story looked like all neatly typed. Not all of the children had previously used typing so I took groups and showed them how to type. Again this required concentration to find the correct letters, put spaces between words, use capital letters and full stops and lock the text under the picture. When they finished I put their work up on the Apple TV which spurred those still typing to finish the task. They were very proud of the new skills they had learnt as well as the stories they had produced. They enjoyed having an audience for their work and reading it out to others. It was an exciting exercise that engaged the children and got them not only using language but also their digital skills. They were able to learn new skills, create a story digitally and share it with their class mates. Tupou chose to write about a sealion. Alexandra wrote about a puppy in a reader. Maggie liked the story about Ben and his teddy. Inquiry Term 3 2018 - Is language being acquired during Maths? One always hopes that by this time of the year shift would be noticeable in language acquisition and maths skills. The children have had two terms to get use to DMiC maths norms and to begin to find "their voice" in solving simple maths problems. While seeing the children day by day you often don't see the small changes that they are making. It is not until a Maths mentor comments on these changes that you also see them. The fact that they sit in a U shape so that everyone can see each other for class discussions shows that they understand the need to look at people when they are talking and not just at Maths time. A small group of children are beginning to get better at putting their thoughts together and not just offering up one word answers. They are attempting to explain what they did in a logical sequence - "First we did...", "Then we ...". They still need guidance with prompts or specific questions to help them become more organised but it is progress. I am surprised at the "Wow" moments that have occurred. A child who previously had difficulty joining the group will say "I want to count!" and will be engaged at least for that part of the discussion. On another occasion a child suddenly starts to skip count when previously they were unable to. When asked why she counted in twos, she was able to say, "It is quicker like that." The child discovery about order not affecting the outcome led to a long discussion. They wrote out the sum and discovered it "was the same but different." They painstakingly looked at each digit and its position discussing in not very mathematical language "That's there but there is that..." and in the end the two boys who were leading the discussion said, "The answer is the same so it must be the same." I was amazed at the interaction so asked would it work for another sum? This hooked more children into the discussion and we found it worked for other sums. So how do I measure this engagement? 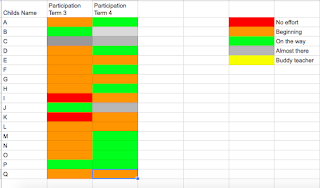 Using the rubric that was devised in collaboration with two colleagues one can see a small amount of progress. Child 1 will engage in conversations by talking and listening but as yet she is not adding much to the group discussions. Child two is normally a fairly quiet observer but the mentor was able to draw her into conversations which I hoped would help her see that she was a valued member of the group. After some absences she continued to try to a be group member by counting and agreeing with how they were trying solve a problem. Child 3 is beginning to see what group work is all about but he still relies on others to do the real talking and thinking. He will occasionally be drawn into watch what the others are doing but he is not taking part in group discussions or adding any comments. 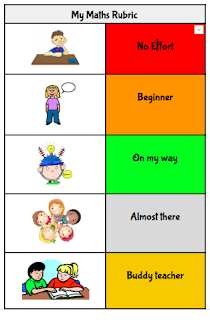 It is this engagement and small steps for some children that show progress. I do not have all my class fully engaged with the problem solving. There are some who still have not engaged fully in group discussions. Others who won't work with someone as they prefer to be the dominant partner. Discussions still need modelling for some eager beavers who want to show they know the answer and don't want to give "wait time" to others. Language might not be the precise language one would hope for but there is language being used instead of a shoulder shrug and some children are prepared to try to offer an explanation. We were told not to expect things to happen over night and how right the tutors were. Be patient and observe the small steps by looking back at the beginning of the journey. The Manaiakalani kaupapa and pedagogy link this week was ubiquitous learning. Ubiquitous learning is so important in extending the time of learning for our children. Prior to the digital age learning occurred only between the hours that a school was open. That meant that the children only had a teacher in front of them for 6 hours a day (not including lunchtime), 5 days a week and for up to 200 days a year. With technology, learning time is extended to be 24 hours a day. This is not to say that a child sits in front of a screen for 24 hours a day but it means that they can organise their lives better. If they wish to attend a church meeting or rugby training and do their home learning at another time it is not an either, or situation. They can choose when they do their work because their work will remain on their site, it is rewindable and accessible at any time or anywhere. Most children arrive at school having heard at least 30 million words. Our children arrive at school up to 2 years behind those who have had a more privileged up bringing. They need to run to catch up those lost two years but in the meantime the more privilege children do not stand still which makes the gap even wider. Manaiakalani children are expected to make one and a half years progress if they have a hope of catching up and closing the gap. Being able to learn any time, anywhere, any pace empowers our students to continue to learn and not be part of the summer drop when school is out. 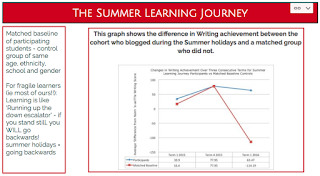 Children are encouraged to take part in the Summer Learning Journey to blog and receive comments on their posting. Research by Woolf Fisher has shown that by blogging twice a week this will maintain their progress and by blogging three times a week this will actually increase their progress. This shows that technology is not just a tool but is a super power enabling gadget. It was then time for some to sit the Google exam while others of us worked on various aspects of the programme we wanted to revisit. Being able to do the Apple Teacher exam was another alternative offered. This has been a great journey of learning and putting myself in my learners shoes and I have been grateful for having this opportunity to learn so much digitally. 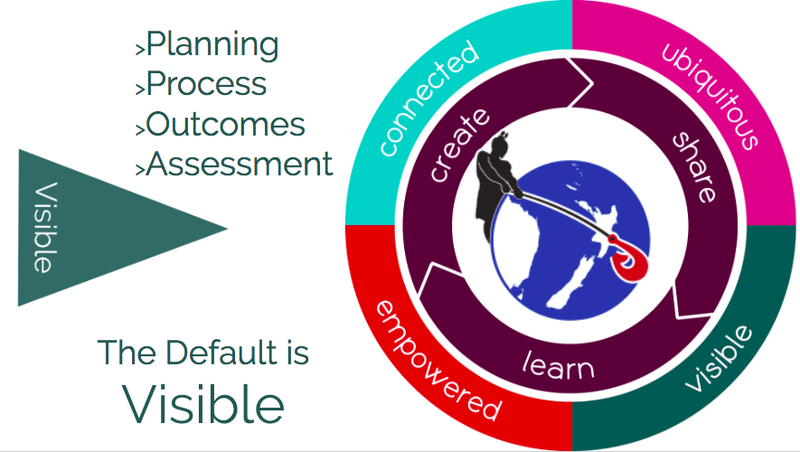 The Manaiakalani kaupapa and pedagogy link this week was cybersmart. 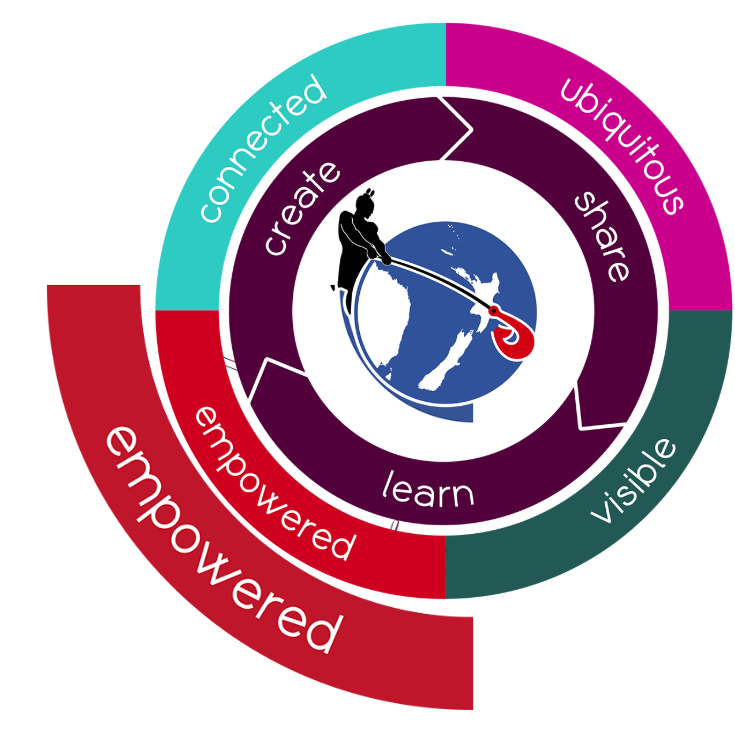 Even when Manaiakalani was in its early stages of development, cybersmart was an important part of the digital learning. In the real world teachers are responsible for children's care and well being so this same care should taken in the digital world where a device can take children anywhere in the world. We need to be able to say to our parents that we have a positive programme to make children cybersmart which will begin in Year 1 with smart learners and smart relationships and continue to be intensionally delivered weekly through out their children's schooling. It uses positive language and teaches children to navigate and be responsible. A smart person is a positive and empowered person. Manaiakalani has put together eleven categories that children, teachers and parents need to know. These range from smart learners and smart relationships through to smart footprints. The Harpara Teacher Dash Board was devised by Jan Zawadzki and because it was created by a New Zealander with Manaiakalani in mind it aligns well with visibile, ubiquitous, connected and empowered learning. It helps keep learners focused and organised on line and provides the teacher with visibility into what learners are working on, thus allowing quick feedback. Work does need to be saved in the correct folders so that visibility is not challenged. Blogs and comments can also be kept track of without having to actually visit the blog. 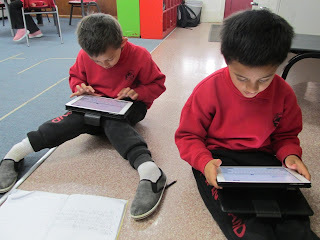 We found out what it is like to use the devices that our learners use. 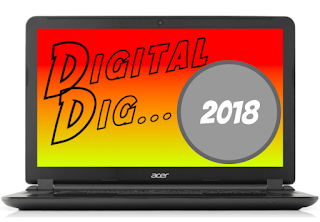 We used the Digital Dig that is designed for learners to become familiar with using a chrome book by doing tasks such as taking screen shots, using the webcam and finding keyboard short cuts. It was interesting putting ourselves in our learners shoes. Khismira took us through how we use our iPad sites for our year one learners to access their learning. 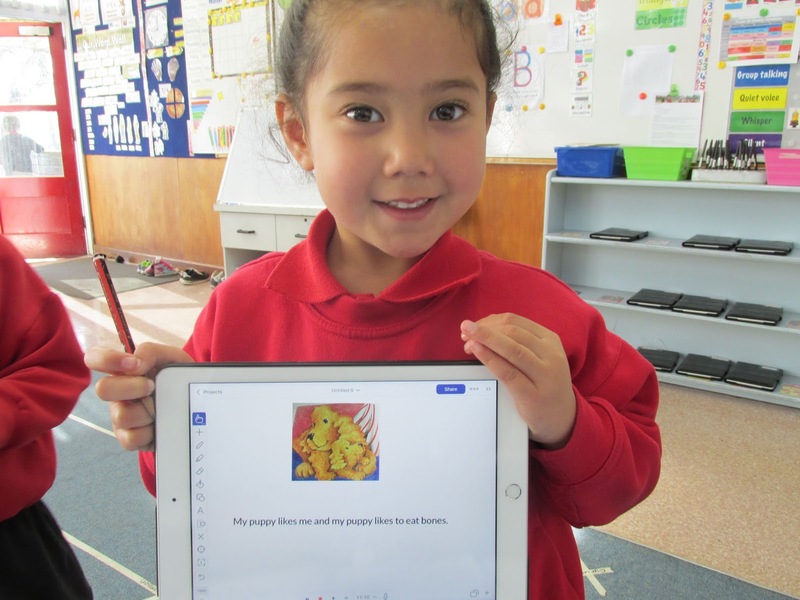 At the beginning of the year we teach the children the kawa of care and introduce the skills they need to complete tasks such as taking a photo, copy and paste, duplicate and locking items down. They very quickly learn these skills and use them to complete activities in Explain Everything. We were all able to try out our skills on an iPad. Screen castifying was a skill we looked at. This could be useful in making tutorials for students to learn new skills. Listening to yourself talking through a process shows how much practise you need to become a fluent speaker to get the precise instructions across without "umms" and pauses. It is something I need to practise! We had to prepare and castify using one of applications that we have found useful. I chose Goggle Keep which I have found very useful in keeping organised. 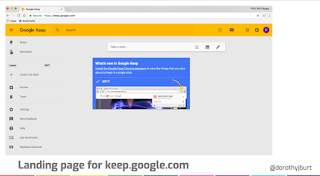 Here is a quick video tutorial on how you can use Google Keep. 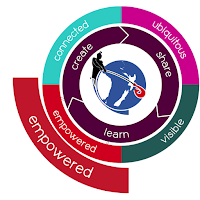 This week to connect with the Manaiakalani kaupapa and pedagogy Dorothy took us through the visibility aspect of "Learn, Create, Share". All aspects are important and interconnected but we need to ask ourselves is the whole of our learning journey, as well as the learning, visible? We expect our learners to be at the centre of the learning and for every part of the learning journey to be genuinely visible to them. We like to plan and be prepared in many aspects of our lives. Mystery trips might have a place but most of us will use expedia, Trip It, Goggle travel or similar to plan our travel and look for where we will be staying, plan day trips or excursions so that there is no surprises or guess work when we are in unfamiliar territory. This is true for our students. If there is no timetable or they are not told what to expect with their learning it can leave them in the dark. Even my Year 1's look at our visual time table displayed and say "Yay, we have Makerspace today!" and they will remind me that after reading they have Makerspace. 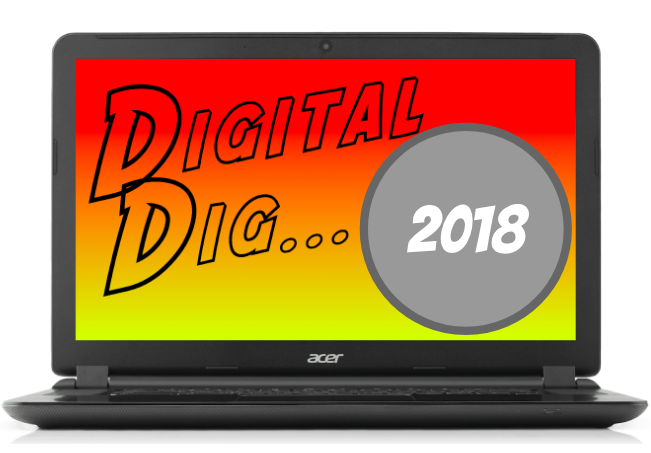 In our digital world this is just as important that we do not shut our learners out of their learning but having the site, folders and blog visible. Learners need to know the path ahead through their learning to help everyone understand and have rewindable learning. Previously parents were able to look at their children's books to view their child's learning but with a digital device they often feel shut out. With Harpara Teacher Dash Board, which is not only for teachers, there is a parent portal. Parents are able to see what their children are learning, the books they are reading and the resources they are using. Everything is visible and they are not locked out of the learning process. Gerhard introduced us to Goggle Keep. I had installed this during the previous week after being introduced to it by a colleague. It is good to make notes and keep links together but Dorothy and Gerhard introduced so many more uses for class and personal uses from shopping lists, reminders, typing notes and taking photos of cursive writing and turning it into text for students who have difficulty reading cursive writing. A useful addition to keep yourself organised and on top of your work. We also looked at our sites to check the visibility. We need to keep in front of mind who will be using our sites. 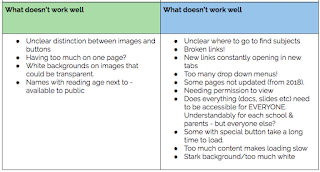 For me, year one children need a clean and clear site with an easy "three click path" to their learning. Using photos of their group or the subject helps them navigate their way around the site more easily. Having the chance look at our own site with a new set of knowledge and to take on board comments from others was very beneficial. 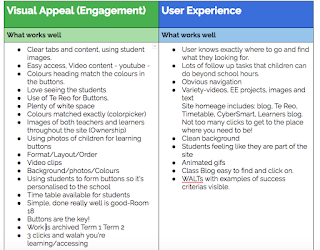 Making up a list of what worked and what to avoid will be a great help in setting up next years site as well as using the feedback to make improvements to my present site. 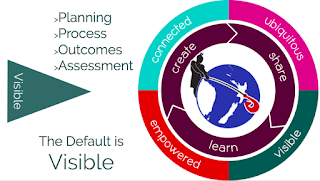 This week to connect with the Manaiakalani kaupapa and pedagogy we looked at the "empower" side of "Learn, Create, Share" which is on the outer circle but is of no lesser significance. It links directly with visibility. Dorothy described how for many of our whanau life is a struggle. They rely on other outside "agencies" for so many of the things we take for granted such as housing and money for necessities and feel totally disempowered and do not have a positive outlook on life. Our children start school disadvantaged in that they hear significantly fewer words spoken in their whanau. Children are great imitators or modellers. If they do not hear words or sentences to model their oral language on it will disadvantage them. How can they ask for an explanation of a maths problem if they have not practiced asking questions like more advantaged two year olds do? Research has stated that our children arrive at school already two years behind more privileged children. Also there is approximately a turn over of a third of our students in a year. The housing redevelopment is adding to the turn over where a whole street may be rehoused elsewhere while redevelopment takes place. But this community is prepared to spent $3.75 a week on the purchase of a chrome book because they could see that it wasn't replacing a book with a fancy tool but it was providing their children with an experience and opportunities that were life changing and in transforming their lives they were becoming more empowered. Children have a world of knowledge and opportunities at their fingertips. The digital world helps to empower our community. They can overcome some of their disadvantages because their focus is not just the local community. Two examples of this is on line shopping and medical consultations such as those that Dr Lance O'Sullivan has pioneered in rural communities can be used to over come the problem of the lack of transport. It is not only children that need to be empowered but also the teachers. They need to be able to deliver the digital curriculum and manage their own information and data. 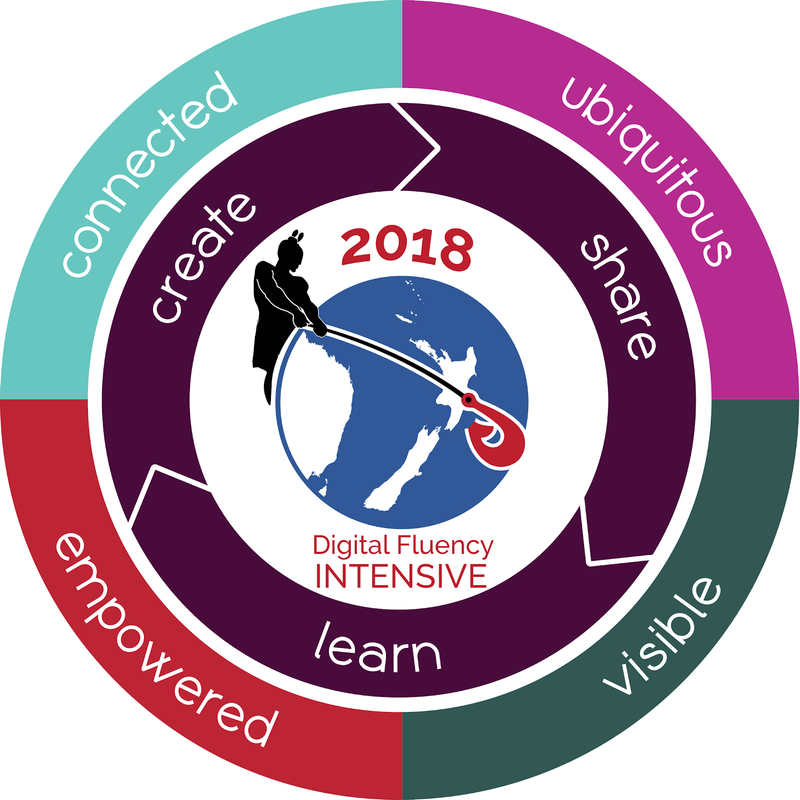 Digital Fluency Intensity was seen as a way of empowering teachers, where ideas can be learnt and tried. Gerhard showed us some tips, tricks and tools to manage our work flows. Installing one tab to group similar tabs together sounds like a sensible way of managing tabs. He also mentioned Toby and Toby Mini as well as bookmarks as other systems which create collections of tabs. There is no right or wrong way to manage your work flow but by experimenting you can find to find the tool that works best for you. We also looked at how to manage our Gmail and looked at our personal preference settings. By putting unread emails at the top of the page you are more likely to deal with this mail and not let it sit unforgotten way down at the bottom of the page. Gerhard talked about archiving mail and not deleting it, filters, grouping conversations, starring conversations and attachments. A handy tip about labs was to be able to undo a sent email. How often have you gone to hit send and remembered you wanted to check something before you sent it - this gives you 20 - 30 seconds to recall the email. Organising your life with a calendar was really useful. I set up a personal calendar as well as a class calendar for Room 16. Having these to the side of your gmail is very handy. Hangout was the main learning session today. We learnt how to create a meeting environment which anyone can join. It was all a new experience for me and we were lucky to have help at hand to link all of the group to share a place that is important to them. After lunch we set up another hangout to share information on the digital curriculum. 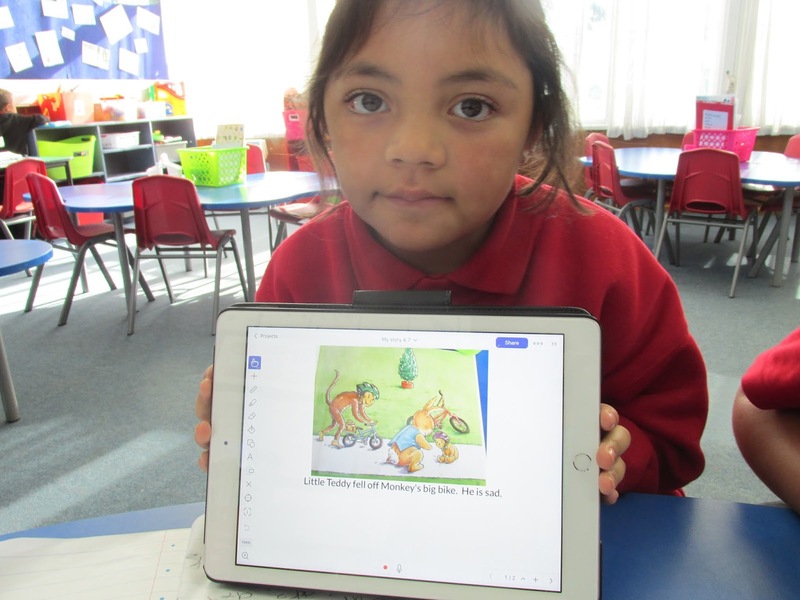 I can see children would enjoy being able to see and talk with children whom they had blogged with through the Tui Mai Tuhi Atu programme or even share another classes learning experience. Even within team one I can see the juniors would be excited to share their learning with another class via a hang out. 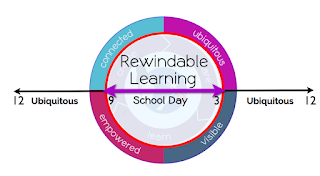 This week Gerhard shared with us the "connect" side of the Manaiakalani kaupapa and pedagogy which surrounds the inner circle of "Learn, Create, Share". This connectedness extends from ourselves outwards from the school, community, country and on to a more global connectedness. The Manaiakalani Clusters connects us to a powerful network of learning. At a cluster level we are all close geographically, but because we are often all so busy there is not time for us to connect face to face. In our cluster we are also a diverse group of primary schools, a kura kaupapa, a Special school, a catholic school and a high school but what we have in common is the Manaiakalani kaupapa and pedagogy. By keeping in touch digitally we are able to relate to others and it gives us a sense of belonging. This network of schools and clusters has now grown wider to encompass learners from the far North to Christchurch and the West Coast in 11 clusters. We all have a shared language which leads to an instant connection to a powerful network of so many teachers and learners. Even though we haven't met personally we are all committed to this incredible journey together and it is this cohesiveness that is so important. Teachers share resources, toolkits and PLD and have an on line facilitator. 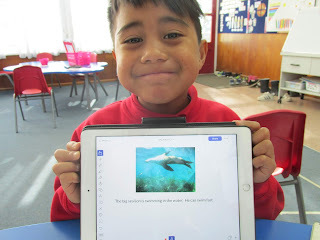 Similarly students interact and connect with other students using their blogs and Tuhi Mai Tuhi Atu where classes connect and comment through their blogs. As educators we need to see the importance of blogging. It is through this two way process of giving and receiving that we connect. It helps us to stay connected and to be creative and not just consumers of content. 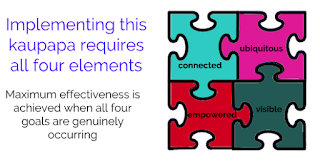 Effective connectedness can not happen in isolation. It is like a jigsaw needing all pieces to be present to maximise the effectiveness of it. 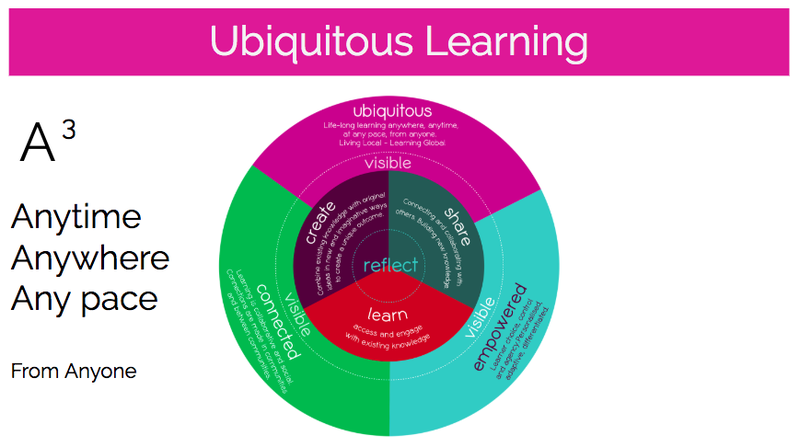 It needs to be linked with visibility and be ubiquitous to empower the learner. Once these 4 elements come together learning can be turbocharged. A team from OMG Tech introduced us to the future of technology and what it means to our students. The team wants children not just to have their faces turned towards a screen but to look outwards and use their curiosity to light up a pathway that will transform their lives. New Zealanders have a unique way of looking at things and this is reflected in how so many famous New Zealanders have gained notoriety for example Rocket Man, Weta Workshops, Britten Motor Bikes. The only way to get more people into the technology field is to educate our children to ensure they have a voice in the technology they use. 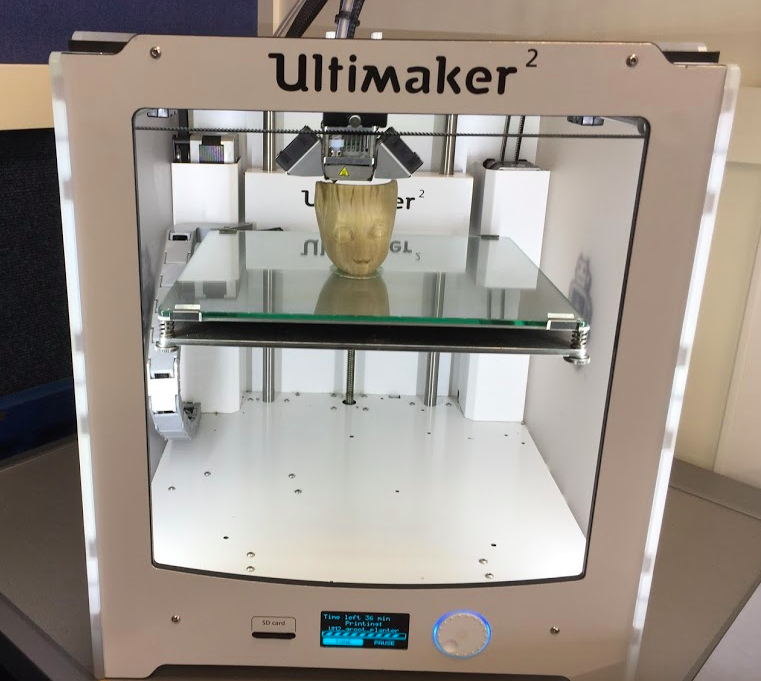 We need to care about technology today so that when the key computational thinking ideas in the technology curriculum are introduced by 2020, our children will be prepared to be makers and creators of technology that reflects our distinctive New Zealand values and culture. 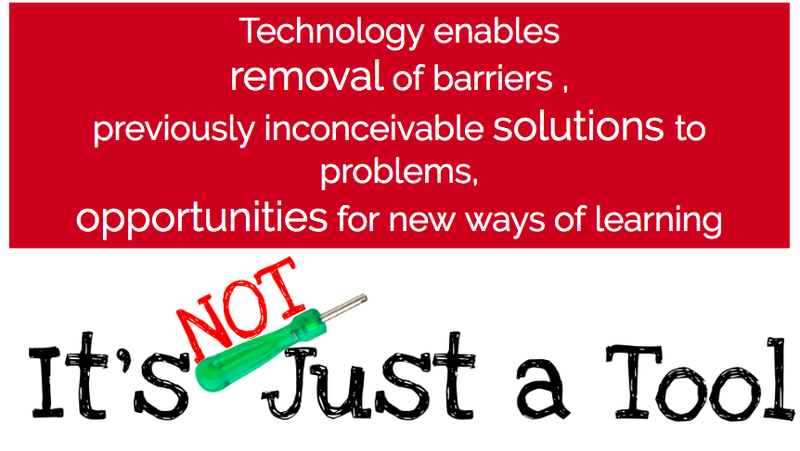 And we as teachers need to be prepared to teach our students from year 1 to 13 the theory of how technology works and how they can use this knowledge to solve problems. Using games was a great way for us, as well as for children, to be to introduced to the subject of computer science without using a computer. 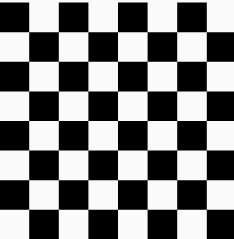 A large chequer board was used to demonstrate moves of how to get from one position to another. It showed that computers only understand exact instructions and can only do as they are told. 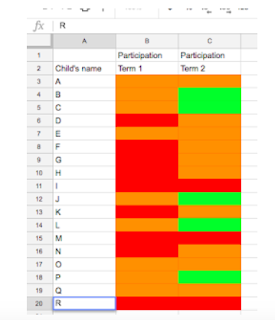 Sorting data into order makes it easier to work with and made a great team activity. We sorted numbers from lowest to highest by doing 10 passes to get ourselves into a line from lowest to highest. 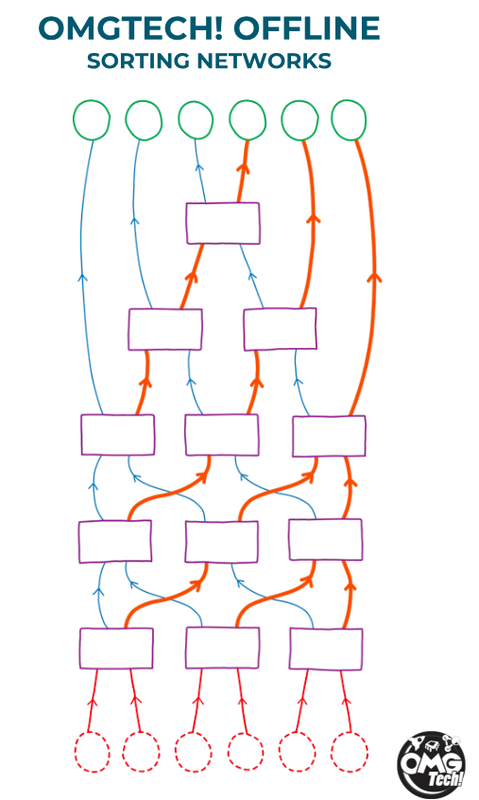 A sorting networks game was a great way for us to learn about "flops" and I could see that children would enjoy this games by working together to move at the same time. The introduction to Binary and Data representation also had some exercises to do first using tokens to show that columns were completely full or completely empty and then writing down the binary number. We then looked at hexadecimals and converted binary numbers into hexadecimals which children need to understand in year 7 and 8. Learning about programme outcomes is a bit like learning grammar and the fact that you do need to understand how to use it as a tool before you can use the basic knowledge. We then moved on to "Scratch" and looked at the tools needed to build a maze and control an animal going through the maze. I can understand the fascination that children find in creating games with "Scratch" thinking about the characters, the setting, sounds, looks, events, sensors and controls that one can build into a game. There is a lot of thinking behind each instruction. 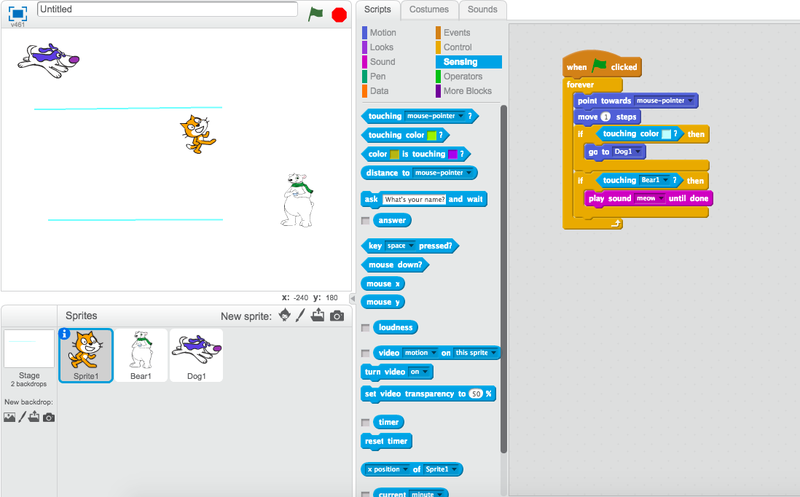 Scratch Junior for 5 to 7 year olds might be something to look at for our juniors. 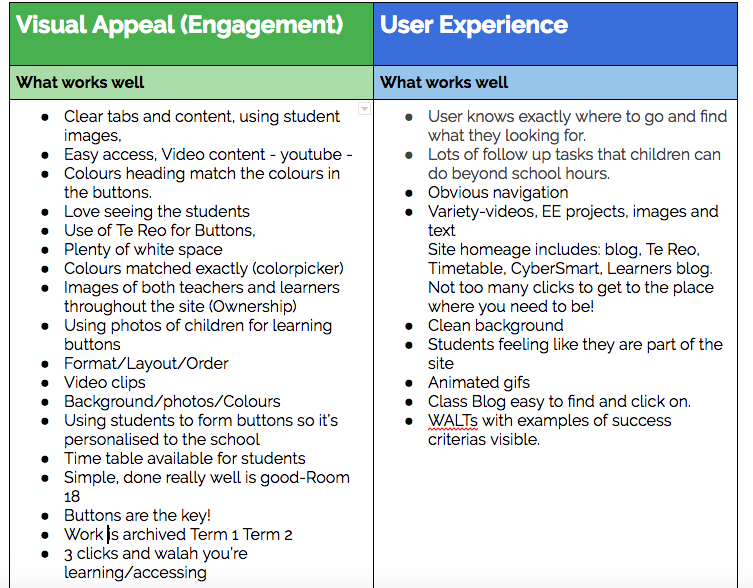 Looking at the year one component of the digital technology curriculum, it has teacher led activities to develop an understanding that computers are built by humans to store and share digital content. Using a simple drawing activity to get children thinking about what lies underneath the case of a computer or getting the children to draw how they think the internet works would be a popular activity. We all need to use our imagination to think of what lies behind the case of a computer! 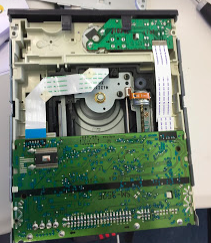 To aid our own thinking of what lies inside the case of a CD Rom we were able to dismantle a CD Rom. Looking at the tiny motors a stepper and a DC universal motor along with all the other components and tiny screws was fascinating. 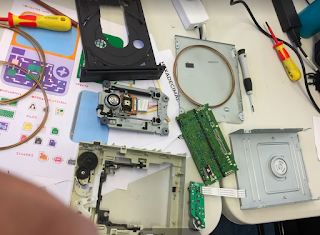 I think most of us would be fascinated to look inside a computer to see how it really works. Imagine how engaged children would be going to Makerspace and fixing a computer! We were also introduced to 3D fabrication, watching a 3D printer and using a 3D pen. The pens were easy to use once you were able to manipulate the flow of the pen and could be used to create so many things. I hope we can inspire our school's Makerspace to invest in some of these pens so that our children can be creators in the 3D world. You never know, it may just be the thing that inspires, connects and engages the next New Zealand great engineer to create something to change our lives in the future. Inquiry 2018. Term 2 Reflection. My 2018 Maths Inquiry is based around encouraging children in the acquisition of language and using this language to participate in Maths sessions. The DMiC lessons have been a great way to encourage the use of language. Not only do the children have to work collaboratively to solve a problem but they have to communicate their thinking to a partner or explain their solution to the class. This means they have to understand what the question is asking them to do, as well as being clear in their own thinking what the series of steps were that they took to reach a solution. They need to ask questions to seek clarification and understanding. We have been very fortunate in having DMiC mentors visit the school to help the teachers implement this new method of problem solving. They are able to help us use appropriate "talk moves" and to discuss techniques that might work for our particular children. 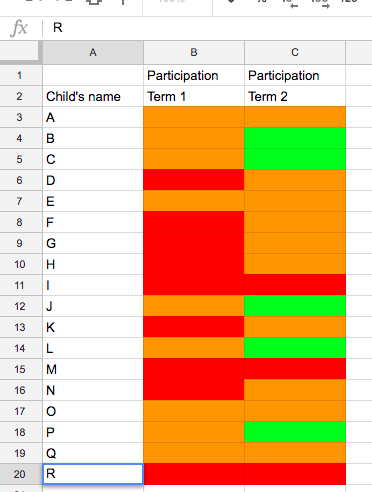 When thinking about how my class is tracking I find they fall roughly into three groups. There are those who are enthusiastic and attempting to participate fully in the lesson. They are trying to use the correct language and put their thoughts into a logical order. The next group are still observing and will occasionally participate but have difficulty in forming questions to increase their learning. They are still learning how to work as a group and how to find out and remember what the question is asking them to do. Lastly I still have some children who will not engage at all. 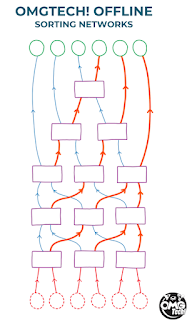 Trying to measure or quantify this shift (or lack of shift) into some visual form has proved challenging. Two other colleagues were also trying to come up with some form of measurement and together we came up with a rubric that the children could also use to see what the expectation was in speaking and participating in Maths. Based on the colour coded 5 levels of participation I then made up a spread sheet of my class. This gives me a clear visual indication of those children who are speaking and attempting to participate in maths and for those that need further help to engage in the programme. 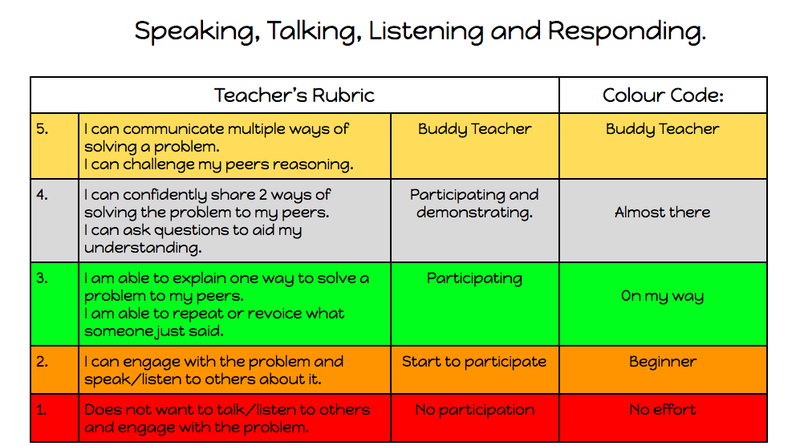 It is a broad indication and priority learners are monitored more closely by trying to look at talking, listening and responding. There has been some movement but not as much as I would like to see. 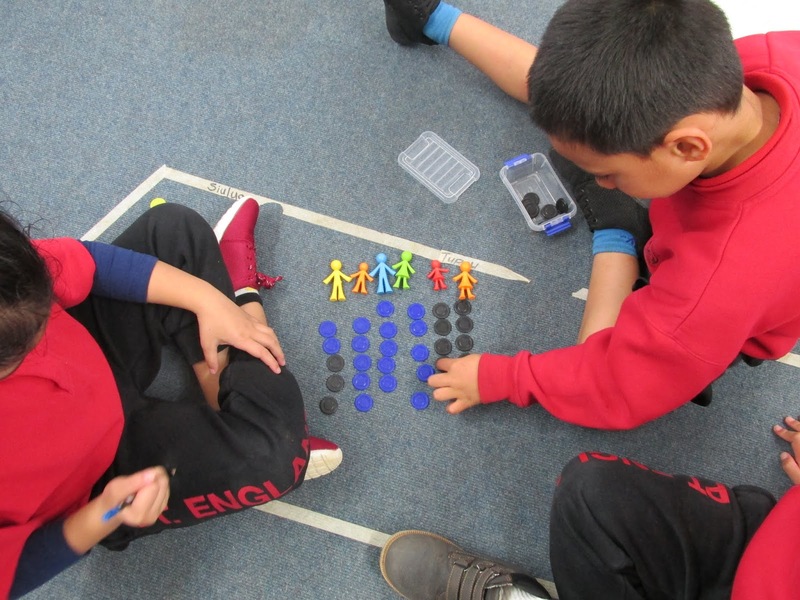 Each day we use our maths wall in our daily Maths warm up as a reference point with discussions arising from changing displays such as subitize dot patterns, tens frames, finger patterns, shapes and so on. Some of the comparative language of size has been used in their stories but it has been disappointing to see it used sparingly other than at Maths time. During DMiC maths the use of questions is limited. Even with constant modelling this is something that our children find hard. When working with others, some groups get bogged down arguing about what drawing they will use to represent the numbers in the question instead of thinking about what the story is asking them to find out. I am also finding it hard to use the correct "talk moves" to illicit thinking which will help the children see a method of solving the problem without giving them an answer. 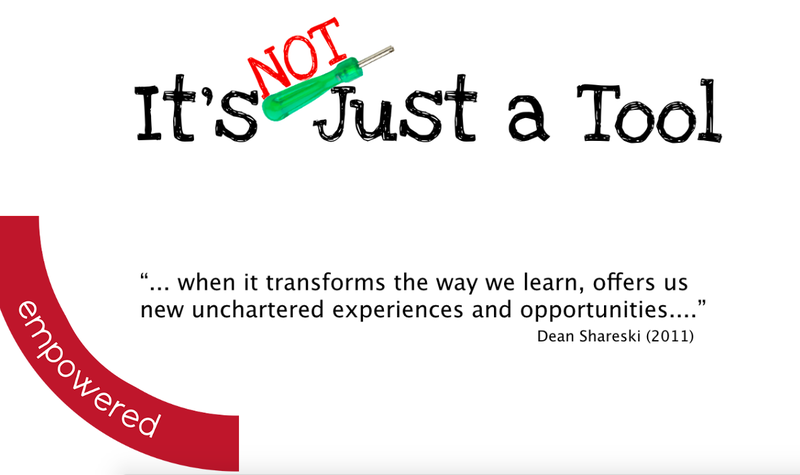 We as teachers so often "teach", so it is hard to let children explore options. We are still at the beginning stage of our maths journey but we are learning so much along the way. The day began differently with us all sharing our digital Pepeha that we made last week. It was interesting to see the connections we had and the variety of slideshows that this creative group had made. We had to each chrome cast our Pepeha and then disconnect so as usual in every task there is learning for us as well. 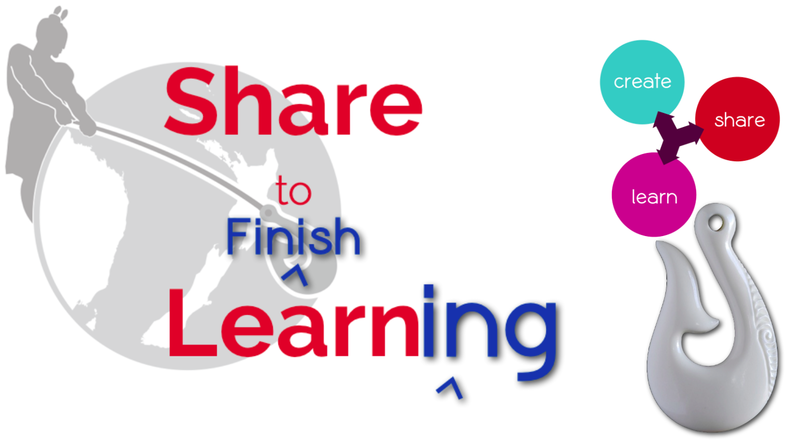 This week to connect with the Manaiakalani kaupapa and pedagogy we looked at the "share" side of "Learn, Create, Share". To share, is an important part of creating relationships. Sharing is as old as time but what has changed is the mode or method of sharing. Since 2005 the biggest change in digital sharing has been the speed and amplification of the sharing. With Youtube, Twitter and Bebo, sharing has become something our students have all grown up with. They readily "share their lives" with a huge audience around the world. It is not only the young who use this method of sharing. Polititians and the rich and famous have taken advantage of the fact that they no longer need to rely on the media to get their message across. 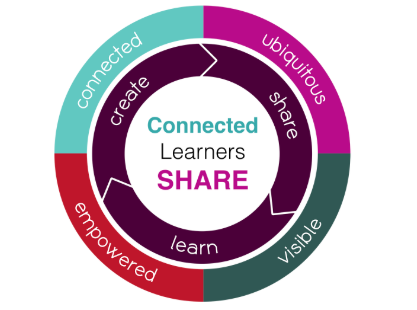 The connect and share way of interconnections are ingrained in their way of life so working "with learners to establish authentic audiences for their learning outcomes" could be another hook for their learning and lead to raised achievement outcomes. It is not an "either, or" way of looking at things but an amplification. You can still publish children's work by putting it on the wall, include their work in a Year Book or in a newsletter but children don't usually have a choice and the "audience" is constrained by time, place and people. You need to be at the venue, you need to listen and you have no choice who you listen to. By choosing to share digitally it brings in an audience beyond the local school or community to a world wide audience. Grandma who lives in the Cook Islands can link directly into her grandchildren's lives watching a live performance of the Kapa Haka group, look at the grandchild's blog to see what they have been doing and watch a movie the child has made about a class trip. 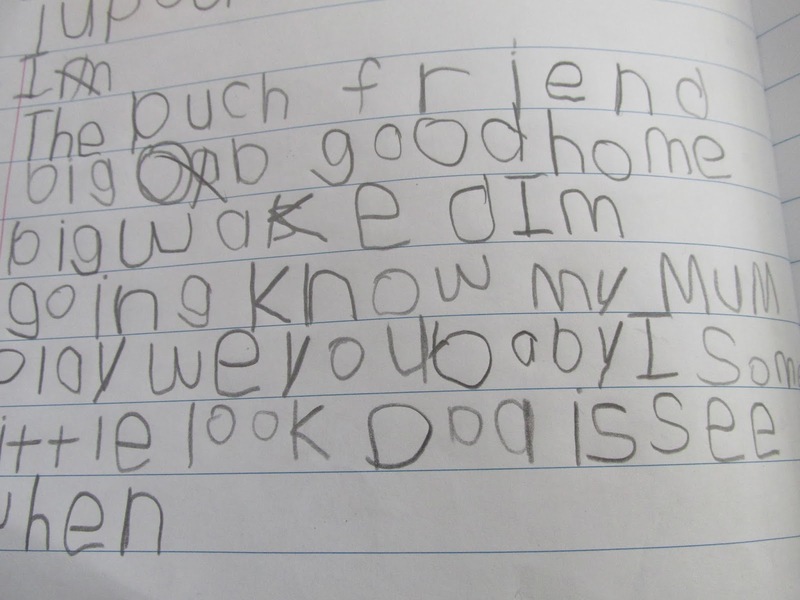 The sharing and connections have a two way purpose and benefit - Grandma is an authentic audience of the child's learning and the child soon learns she has an appreciative audience for her learning by looking at the comments that are left on her blog. Children need to learn that just like in times of old when sharing was not digital, sharing can cause trouble if the rules on how to share are not followed. They need to learn how to use a secure space that is legal which is why our children all have a blog that is owned by the Board of Trustees. The audience is generally not unkind and leaves positive, thoughtful and helpful comments. As a school we try to enforce "family values" and hope that the children take these values with them into being a positive Cybersmart citizen who has a conscience. As Teachers we like to get things finished. To be able to blog and show the world a finished piece of work is an important life skill. If you are someone who never finishes work, people won't want to read unfinished work and employers won't want to know you. In pre digital days work was done in books or on worksheets which were often not pasted in books or it was lost before it was completed. This learning was in books that children only had access to at school. Now learning can be accessible any time and any place. It could even be at a later time when a thoughtful comment could trigger further learning. Learning any time has become an important factor in helping to eliminate the "summer drop". Over the summer holidays many children lose the gains they had made over the weeks prior to the end of the term. 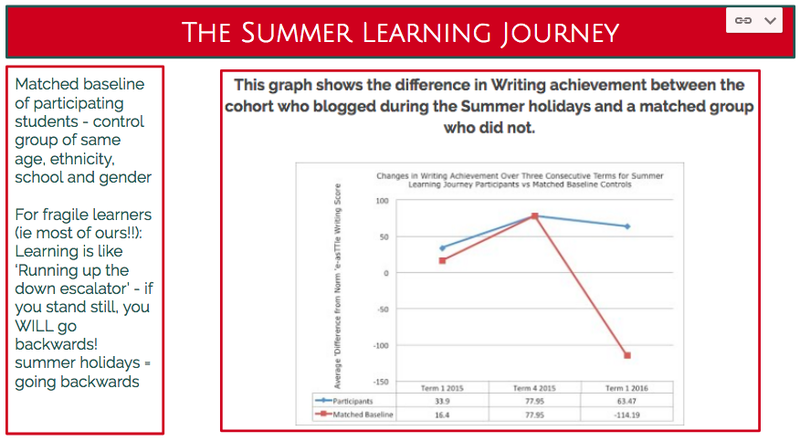 The Summer Learning Journey programme has children blogging through out the holidays. Woolf Fisher research has shown that these children who participate in blogging twice a week will maintain their learning and those that blog three times a week will actually increase their learning. This shows what a powerful learning tool sharing is. 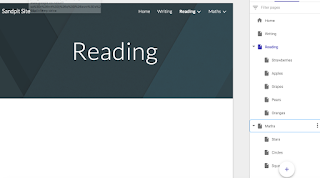 The writing of posts, sharing and receiving positive and thoughtful peer assessments links directly to how you can connect and supercharge learning. Even for my Year 1 learners they love to share their learning. 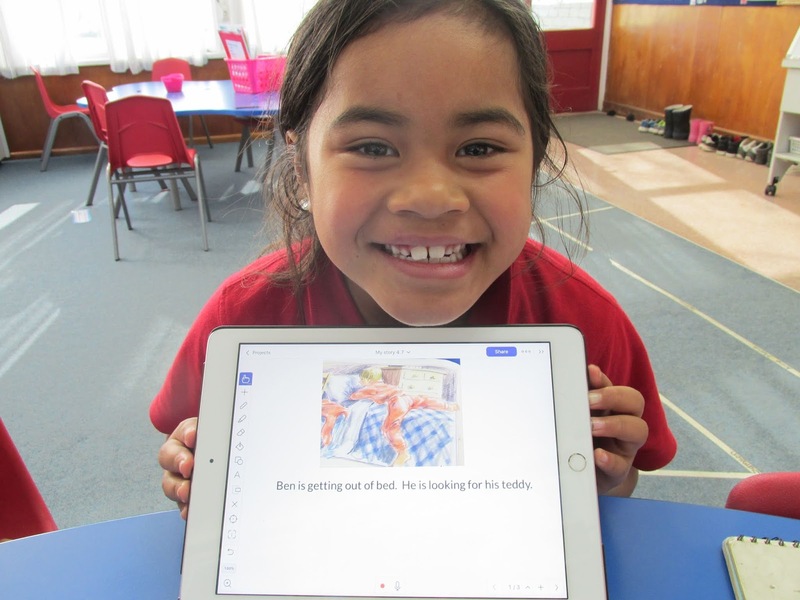 At present we have a class blog where many aspects of my class and their learning are posted so family and whanau can share the moments of success too. 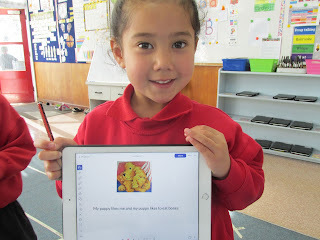 Photos are taken of children's writing, learning and certificate winners, movies are made of activities and school wide activities are blogged about. The children love visiting the blog to see who is on it and reliving things we have celebrated. It is very special when someone leaves a comment. I hope to be able to get some children blogging on their individual blogs towards the end of the year to increase this "sharing" and for the children to have more choice in what is shared. 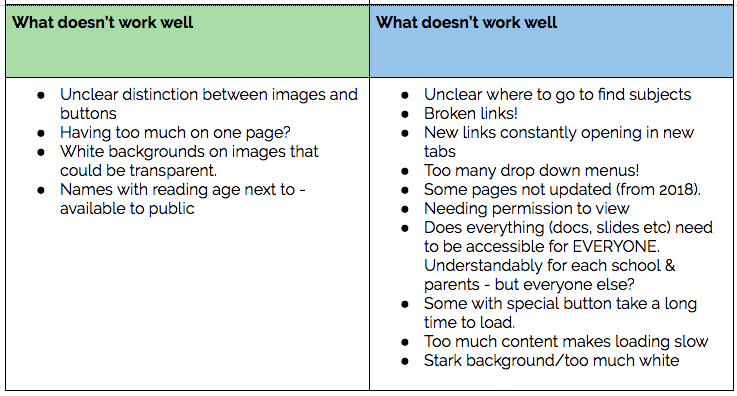 We also looked at Goggle Sites and how to make our sites engaging and multi modal. A teacher who excites and captivates her learners by exciting "window dressing" will encourage her learners to be excited about and participate in their learning. Our children are at school because it is compulsory - they have no choice so we need to be creative to hook them in to learning. Each term the Pt England teachers have an immersion assembly to hook students in to a new terms inquiry topic. We dress up, make movies or act out scenes much to the children's delight. Digital devices are a hook for learning but after a while the novelty wears off so we need to create engagement that lasts the distance. If children are left to their own, they tend to gravitate to off task behaviour. They need to be on task on the right place at the right time doing the right thing. Children also learn in many different ways. 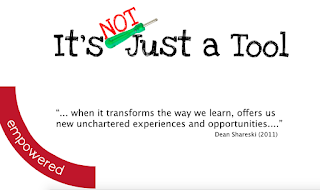 So teachers should provide opportunities for all learners to connect with the learning through many ways. It can be acting out a play, watching different versions of a play, to recreate an aspect which is important to them through video, graphics or sound files. This leads to a higher chance of most learners becoming engaged. If it is just book learning then only those who respond in that manner will benefit from the learning. Fiona mentioned the importance of starting with a new folder before commencing to build a new site. Sites.Goggle.Com was the starting point for us to create a new site. Pages were added for different subjects and these could be disclosed or hidden if necessary. We collaboratively created a site, learnt how to embed items, add slides and duplicated them. 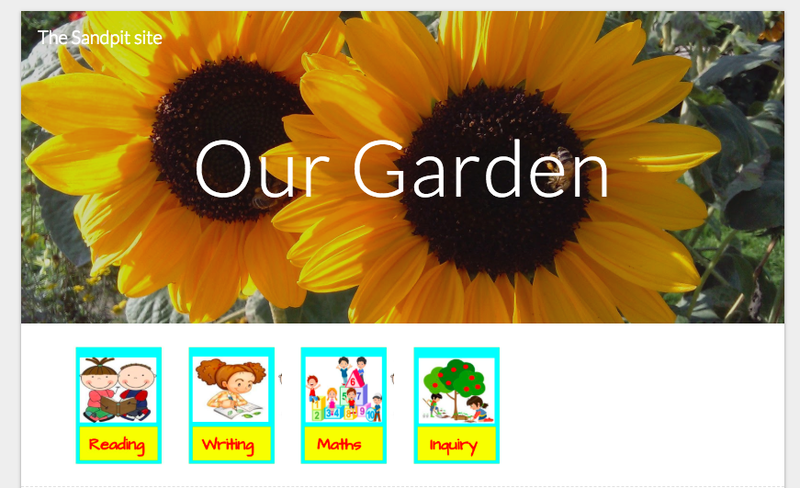 Using information from TKI about the science of growing things, Khismira and I took the opportunity to make a resource about growing food to use with our healthy food Inquiry topic for next term. We incorporated familiar resources in reading such as PM readers that the children already use and on a sub page we put stories that the children can listen to about growing things. In maths we created some problems that the children could solve and found prompts that the children could use to write about. 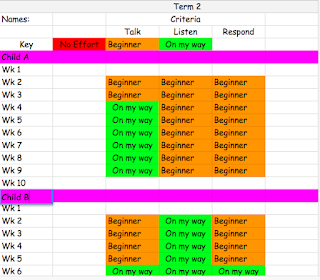 It was a valuable time of learning as well as creating a useful resource we maybe able to use next term.